Vestax�s original Anti Skipping Tone-arm System ensures high sound quality and stable playback by reducing the inner and outer force of the needle, suppressing horizontal vibrations. The entire system, from bearing parts to assembly, is performed by seasoned Japanese pros, which is why the A.S.T.S. tone arm is appraised world wide for its quality. ■Direct Drive DC Motor　UPGRADED! The PDX-3000mk2�s direct drive DC motor has powerful torque of maximum 4.7CN/cm, and reaches a constant speed rate within 0.5 seconds from pushing the start/stop button. An extremely precise regulator is required to accurately control such a motor, and with the PDX-3000 it is digitally (32bit CPU) controlled with a digital servo. This servo keeps the motor rotating no matter how heavily the pitch is changed, reverse button is pushed or the platter is pulled back. With an advanced digital servo in combination, Vestax has cast a new mold to optimize the balance between the platter weight and rotary inertia moment. This enables the DJ to perform with higher stability and accuracy. Having the surface been lowered, DJs have more control over vinyl, along with carefully designed sides for precise pitch adjustment. The digital servo firmware is the brain of the control circuitry. Over the past 10 years it has advanced in order to provide better analog simulation of torque control to DJs. Two control modes can be selected for the DJs preference. Performance mode maintains the stabilized speed and rapid acceleration/deceleration, while MIX mode enables to control precise rpm with the slightest touch to the platter. The ultra strong high pressure foamed ABS plastic that constructs the body is advanced in durability, strong against feed back and is highly resistant to impact. ■ AIR SUSPENSION INSULATOR　UPGRADED! The Ultra Pitch Fader controls the pitch range by +/-50%. Combined with the fine pitch fader, a total pitch control of +/-60 % is possible. 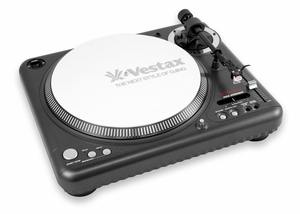 The classic feature Vestax introduced to the world.